Santa Lucia is a holiday in Sweden celebrated on December 13th. Leading up to the day, the prettiest girl in town is chosen to represent the saint in a candlelit procession. Lucia is an Italian saint who lived in Sicily about 1,800 years ago and who died for her Christian faith. She became very celebrated throughout Italy and her day has been marked on the calendar and celebrated in Sweden since medieval times. However, today's Swedish tradition dates very much from the lat 19th century and has more to with a celebration of light than Christianity. What is important about the holiday, is of course, the food. Traditionally, saffron flavored sweet rolls are served along with copious quantities of mulled wine. 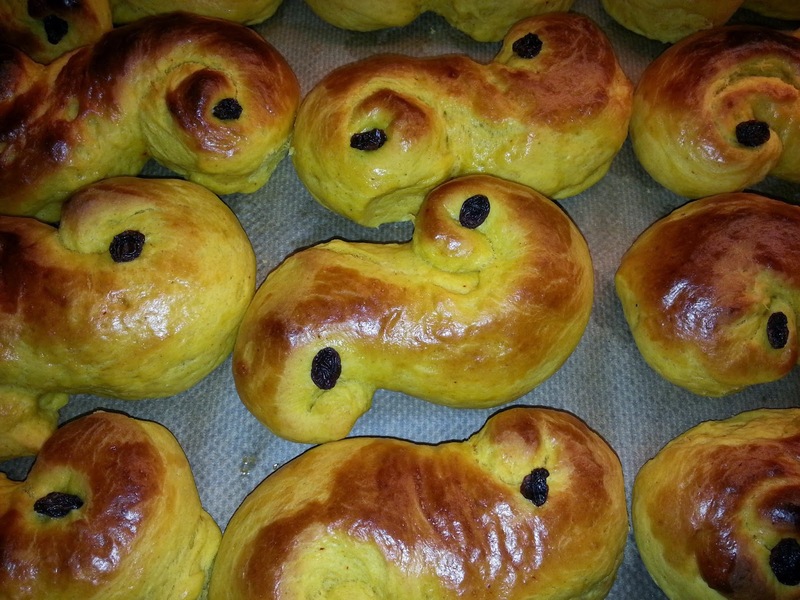 Lussekatter, as these rolls are called in Sweden, are a slightly sweetened saffron bread. They are actually a bit bland to eat, but the flavor grows on you; the first mouthful is a bit dull but by the end of the roll, you are ready for another. I wanted to liven the traditional recipe with some candied orange peel and perhaps a topping of rock sugar, but my family protested terribly against any alteration from the traditional! Melt the butter in a large pot on the stove with the saffron. Take off the stove. Measure out the milk. Pour the milk into the butter until the mixture feels just warm to your finger. Set any remaining milk aside. Crumble the yeast cake into the butter/milk mixture and stir until the yeast is fully dissolved. Add the rest of the milk and the cream to this mixture. In large bowl, measure out 14 dl of the bread flour, the salt and the sugar. Make a hole in the middle of the flour and break in the two eggs. Beat lightly with a fork and then pour in the milk/butter mixture. Stir the flour and liquids together with a large wooden spoon until it is combined. If you feel that the mixture is firm enough to knead, you can turn it out onto a floured board. If it is still too sticky, add more flour until you feel it is firm enough. Generously flour your hands and the board and knead the dough, adding more flour when the dough gets sticky. Knead for about 10 minutes until the dough becomes smooth and elastic. 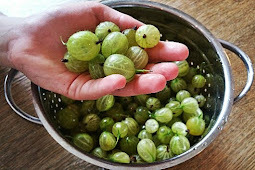 Put in a bowl and cover with a towel and leave to rise for an hour. Punch the dough down and knead for about a minute to get the air bubbles out. Cut the dough into four pieces and then cut each quarter into 6 to 8 pieces. Roll each piece into a long snake. Curl the snake in opposite directions on each side until you meet at the middle. Stick a raisin into the center of each curl. Place onto a baking sheet covered with parchment paper, leaving plenty of room for the buns to rise. Cover with a towel and leave to rise for about an hour. Beat an egg and brush the tops of each bun. Heat the oven to 200 degrees Celsius and bake for 8 to 10 minutes until golden on the top.